The question: “How is the ideal related to and distinct from the actual?” is crucial to the understanding of Gandhi’s philosophy. The failure to appreciate this has led his critics either to misrepresent him or to call him inconsistent and full of contradictions. Although for understanding Gandhi’s philosophy it is necessary that the concepts be understood in the context of Hindu philosophy, it is equally important to bear in mind that Gandhi’s connotations of terms are different from the prevalent ones. Quite often they sound national or geographical, when in fact they are universal. He never seems to have realised that this could sometimes have the effect of damaging his own purpose.9 The ultimate ideal for Gandhi, as he repeated several times, is unrealised and unrealisable; its value consists in pointing out the direction. According to him, there must always be an unbridgeable gulf between the ideal and its practice. The ideal will cease to be one if it becomes possible to realise it. He argues: “Where would there be room for that constant striving, that ceaseless quest after the ideal that is the basis of all spiritual progress, if mortals could reach the perfect state while still in the body?” Striving after the ideal is the very essence of practising Gandhi’s philosophy. To the extent we make this effort, to that extent we realise the ideal. Two basic principles, Truth and Nonviolence, are the foundations of Gandhi’s philosophy. At the highest level of experience they merge and become one with God. The ideal of reality is also the ideal of value - a distinctive mark of Hindu philosophy. God, therefore, has been referred to by Gandhi as Truth or Love (nonviolence in its perfection). His ideal of life, self-realisation, therefore, is couched in ideal terms, when the Unity of Man and God has also been achieved. Gandhi, however, is fully aware that in actual fact, at the present level of human experience, there is a gulf between man and God; indeed, this gulf will never be completely bridged as long as we are in this body. “Being necessarily limited by the bonds of flesh we can achieve perfection only after the dissolution of the body.” But while in this body, the gulf can certainly be narrowed. Thus recognising the imperfect nature of man, Gandhi’s prescription would be to follow the relative truth persistently which he called “satyagraha”. This shows the dynamic character of his ideas. In order to achieve this ideal, he prescribed an ethical discipline - the observance of vows which he defined as “doing at any cost something that one ought to do”. But taking of a vow does not mean that we are able to observe it completely from the very beginning, but it does mean “constant and honest effort in thought, word and deed, with a view to its fulfillment”. It is no doubt true that in this way the practice of the ideal becomes very slippery indeed - anything could be justified as following the ideal. But this is unavoidable as is the fate of all ethical ideals whose observance can hardly be a matter of strict objective scrutiny; it would ultimately depend on the spirit of the person who observes it and which no outsider can determine fully. At the same time, it does not condone the moral lapses of the individual; rather, this consciousness should make one strive to overcome the imperfections. Gandhi’s adoption of nonviolence as a method of pursuing truth is due to the fact that man, imperfect as he is, can only strive, he cannot command the result. Perfect nonviolence, being the attribute of God alone, cannot be practised by human beings. Being a part of society, man cannot but participate in “himsa” that the very existence of society involves. 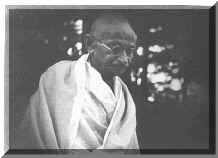 Gandhi, therefore, would consider a person true to his faith if “there is an effort to avoid the violence that is inevitable in life”. That is how Gandhi’s ideal of nonviolence is translated into actual practice. In essence, it consists “in allowing others the maximum of convenience at the maximum inconvenience to us, even at the risk of life. Everyone has to determine for himself the amount of inconvenience he is capable of putting up with. No third party can determine it for him.” Gandhi believed that one should rather be conscious of one’s imperfections than that one should lower one’s ideal; this would spur the individual to perfect himself. The application of nonviolence and satyagraha to social and political fields has been a subject of great controversy. So complete was Gandhi’s faith that he considered it a remedy against all social evils. What makes it a unique method of bringing about change is the transformation of the whole atmosphere, satyagrahi and the opponent included. Its success or failure is not to be judged in terms of victory or defeat of one party but in terms of a change of heart of both. It is not merely a form of persuasion which is aimed in one direction only. If, in spite of the best efforts of the satyagrahi, some moral coercion is felt by the opponent, then such coercion is unavoidable because of the imperfect nature of the satyagrahi. However, he is obliged to try his best to reduce this unavoidable coercion to the minimum. That alone would make it different from passive resistance. Ideally not even a group organisation is necessary. “A man or woman who is saturated with ahimsa has only to will a thing and it happens.” This is because a perfect satyagrahi would be nearer to God; and what is beyond His power! Since such a perfect satyagrahi is not available, Gandhi realised the necessity of group action. Also satyagraha has its educative purpose, which is to bring about confidence in the community. Gandhi’s method strongly emphasizes the need of ethical discipline, whose essential ingredient is courage - the courage of dying without killing. Having decided upon the rightness of a situation, Gandhi would not like one to be a passive spectator to evil. That would be participation in the evil itself. If one does not have sufficient nonviolence to die without killing one should not shamefully flee from the danger in the name of nonviolence. Rather, Gandhi would advise killing and being killed. While for himself he did not believe in the use of arms at all, he would not hesitate to advise their use by those who had no faith in non-violence. “If there was a national government, whilst I should not take any direct part in any war, I can conceive occasions when it would be my duty to vote for the military training of those who wish to take it. For I know that all its members do not believe in nonviolence to the extent I do. It is not possible to make a person or a society nonviolent by compulsion.” Under certain circumstances, nonviolence may be only a matter of policy, as it was with the Indian National Congress. But this cannot be identified with the level of nonviolence which Gandhi personally was capable of. There is not a uniform pattern of application of nonviolence for all individuals and societies. Gandhi is sometimes talking in terms of the ideal, sometimes from his personal level; and sometimes from the point of view of what he considered the Indian masses were capable of doing. It is this distinction, which is not always made explicit, that gives the impression of inconsistency. Sometimes a confusion is made between the acts of the individual and those of the State, and it is expected that Gandhi’s State is to be nonviolent. But how is the State to act nonviolently, when for Gandhi it “represents violence in a concentrated and organised form”? Indeed a nonviolent State is a contradiction in terms. Ultimately, when nonviolence is the governing principle of society, we could not call it a State - it could only be called a nonviolent stateless society. And that is the ideal for Gandhi. In such a society people would simply grow accustomed spontaneously to observe their social obligations without the operation of the state. The necessity of legal enforcement arises because of human imperfections. The more the individuals have imbibed the spirit of nonviolence, the less the necessity of the state. This is the implication of Gandhi's concept of Swaraj. “The attempt to win Swaraj is Swaraj itself.” It is a developing ideal and is “better than the best”. Gandhi calls it “indefinable”. In the context of the Indian National Movement, he said that Swaraj did not mean merely political independence but “many other things”. A Western style of parliamentary government he would accept as Swaraj for the time being only. While in the ideal society there is no room for the military and the police, yet in the actual State there is provision for it according to the moral level of its citizens. That is to say, a predominantly non-violent State is the practical possibility and is the second best ideal of Gandhi. Failure to recognise the levels in Gandhi's thought results in such confused statements as this: “It is indeed clear that Gandhi held essential ideals in common with anarchists, that he was willing, as they are not, to accept a degree of state organisation and control. He believed that government to be best which governs least, and yet he held that ‘there are certain things which cannot be done without political power’, even though there are ‘numerous other things which do not at all depend upon political power’....It would, of course, be incorrect to suppose that Gandhi thought of retaining the state as some intermediate step in a determined progress towards anarchical society.”10 Gandhi’s actual State does concede the desirability of using the military and the police to deal with anti-social elements and defend the country. What, however, distinguishes his approach is the admission of weakness not of the doctrine of nonviolence or of satyagraha, but of the individuals who practise it. Whatever political institutions Gandhi accepted, he did so only as a transitional device, to be transcended by better ones. No institutional device is final. They must evolve with the evolution of individuals. In actual practice, it would be a mixture: “A government cannot succeed in becoming entirely nonviolent because it represents all the people.” He expected that the national policy would incline towards militarism of a modified character. While fighting for the independence of India, Gandhi was conscious all the time of the necessity of moral upliftment of the individuals who were to work the institutions after independence. In directing his energies towards political reform his method was equally directed “to educating the individuals to rise to a moral stature”. He says: “Responsible government, which is a gift without the will and power of the people behind it, will be a mere paper responsibility hardly worth the paper on which it may be printed. If it is a fact that the atmosphere for immediate self-government among the states is not propitious, and the people are not ready to pay the price, it follows that they should have the proper training.” When, therefore, Gandhi is criticised as a politician, such criticism is mainly based on his having one end in view, viz. the national independence of India; it ignores the other important principle of Gandhi, namely the moral training of the individual. In the economic field, Gandhi holds to the ideal of Trusteeship. Ultimately he subscribes to “non-possession”. But in actual life he admits that some possession is unavoidable for the maintenance of the body and its needs so that it may be used for performing its duties. But property must always be held as a trust for the people and must satisfy this instrumental character. While absolute trusteeship is no doubt an abstraction and is unattainable, like Euclid’s point, an effort in this direction will remove the hardships of inequality. In the actual world, Gandhi would not even mind State regulation, but with the minimum use of power - by which he means constitutional machinery. He goes to the length of saying: “Every vested interest must be subjected to scrutiny and confiscation ordered where necessary - with or without compensation, as the case may be.” This is what he said in 1932 at the Round Table Conference in London. As a part of a civil disobedience movement in 1942 he could expect “the peasants to stop taxes” and even “to seize the land”. But this was not a matter of “advance”, as Mr. Mukherji terms it;11 nor “a signal change in Gandhi’s ideology” as “dictated by politics”12; it was indeed the application of his philosophy of property when trusteeship had failed. Gandhi never failed to emphasise the need for his ideals, which sometimes even seem to blur the distinction between the ideal and the actual. He talked of independent India adopting - with qualifications - the satyagraha technique against aggression if India could acquire enough nonviolence. He knew very well that the people of India did not have nonviolence of his standard even to expel the British government: why then did he continue to talk of repelling armed aggression nonviolently? For Gandhi, non-violence was not merely a weapon to achieve self-government: for once independence was achieved, a constant effort was to be made to reach the ideal when it would, of course, be possible to defend the country nonviolently. Such an ideal, it is true, was not to be realised immediately after the British government withdrew, but was to be striven for. To conclude: Gandhi’s philosophy lays down moral ideals for individuals and groups to strive for - their value consists in pointing out the direction, not in their realisation. They cannot be enforced from above but depend upon their voluntary acceptance. Unavoidable use of force he considers to be a necessary evil - but an evil all the same. The extent to which these ideals can be practised depends on the ethical capacity of individuals or groups. Accordingly, the actual practice of these ideals cannot be uniform. As a social and political reformer, Gandhi spoke from different levels at different times. But three levels mainly dominate his writings: first, that of the perfect ideal (unrealisable); second, that of his own personal point of view (admitting himself to be far from perfect, yet sufficiently advanced to practise his ideals); third, that of the point of view of the Indian masses. Yet what is implied throughout is this: that even though the ideal may be impossible of attainment, the very act of pursuing it generates the goodwill essential for the well-being of the corporate life. Conquest of Violence (1958), p. 147. Gandhi on World Affairs 1960), p. 35. Gandhiji - A Study (1958), p. 32. “Mahatma Gandhi - Political Philosopher?” in Political Studies, February 1960. “Magnificent Failure?” in International Affairs, April 1964. Tendulkar, Mahatma, Vol. V., p, 206. For example, he expressed his picture of independent India as “Ram Raj” which he explained and meant as “the rule based on moral authority”. In spite of his explanation that by “Ram Raj” he did not mean Hindu Raj but “The kingdom of God”, the God of truth and righteousness, it never failed to arouse the fear of orthodox Muslims that Gandhi meant to establish a Hindu Raj. Perhaps, for a man so thoroughly steeped in Hindu philosophy, a different vocabulary was not possible. Bondurant, op. cit., p. 183. Paul F. Power, op. cit., p. 41.